Inna has been practising yoga for over a decade and teaching since 2008. With a background in media, anthropology and a stint in PR, she experimented with a variety of yoga paths, before deciding to trade her desk for a yoga mat, and embark on an intensive yoga training course in India. Inna is fascinated by yoga in all its forms, its effects, and the intricate links between physical and mental well-being. As a teacher, she loves seeing the changes in people, being a witness, an observer and sometimes a guide, and inspiring students and friends to practice, evolve and grow stronger on so many levels. Inna is also a freelance writer and loves sharing her passion for yoga, travel and the environment both off the mat and across the globe. A word on the practice…. Traditionally, Ashtanga yoga was only taught as a self-practice. Complete beginners are first taught the Surya Namaskar A and B series, with additional postures being gradually added on according to the student’s abilities, both physical and mental. While most practitioners spend time studying the primary series, some eventually move on to the second (or intermediate) and then third or perhaps even fourth. The last two series are somewhat mysterious and only a select few have ventured beyond the fourth. In Mysore, the ‘home’ of Ashtanga yoga, led classes are now taught twice a week (on Fridays and Sundays) and partly serve as a guide for students: breath counts, rhythm, drishti (focused gaze), focus, etc,. These are high energy – for beginners and advanced. Experiencing a led class in Mysore is a powerful moment – the room breathes as one, moves as one, gazes steadily to a single point in each pose, like a moving meditation. The traditional way of doing this practice ‘Mysore style’ is to follow the self-practice method: it starts simply, breath by breath, posture by posture. It is a perfect practice for beginners as well as the more experienced, as the shala (school) in Mysore will have new students doing their practice alongside senior teachers. 5. Portable: It can be practiced anywhere, anytime, by anyone. You don’t need props, belts, walls or even a mat. As long as there is space to extend your arms up and your legs back, then you can practice. This can be a reminder that yoga is not bound by material ‘stuff’. You don’t depend on anything apart from yourself – a breathing body, that’s all. 6. Deepen your understanding of the practice as it is. Feel the breath, bandhas and drishti – pay attention and cultivate awareness. There is also more potential to come into a meaningful relationship with the teacher or guru. 7. Stay in control: It allows practitioners to further refine their own practice. This is refinement in a self reliant way. 8. Watch yourself, not your neighbors, teacher, feet / toenails / pedicure. Observe your thought patterns, habits and just be a witness. A self-practice environment enables one to hear and feel body (and mental) sensations more clearly. 9. Inspiration: Although you don’t want that drishti to wander around the room, or a competitive streak to kick in, seeing other practitioners on the mat can be a source of inspiration and joy. 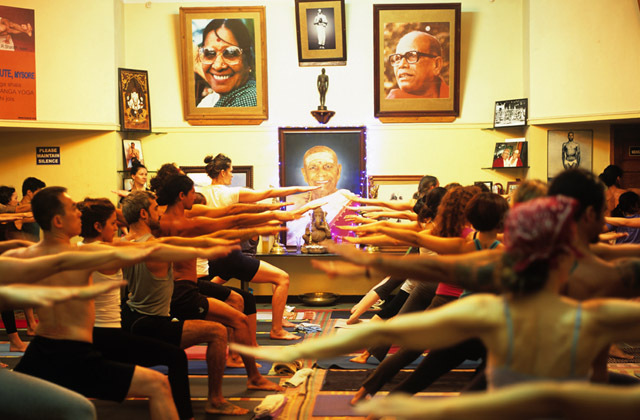 Photographs taken at the Shri K Pattabhi Jois Ashtanga Yoga Institute, Mysore by Coni Hörler. There are more reasons NOT to practice Ashtanga vinyasa Mysore style. It is a rather self-violent style that can easily lead to joint injuries. As a yoga teacher I know many people who injured themselves and had to stop for months. Not surprisingly P. Jois and his son both suffered injuries from their own “invention” and had to stop their own practice. Unfortunately, they didn’t stop teaching it. This style is popular in the West, because it combines aerobic and strength training and helps to shape a nice athletic body, which is a common motivation to practice yoga in the West. Interesting article — I’m always keen to read about different styles of yoga. I currently practise Sivananda and sometimes Bikram, but more recently took a vinyasa flow class. How does the mysore style differ from ashtanga or are they quite similar? And if it is dangerous, is this because people over stretch or put too much pressure on joints when practising? I’m interested to hear what you both have to say. It all depends on your approach to the practice as well life. if you are aggressive you will hurt your self. With a soft and gentle approach to your yoga practice and, not only Ashtanga Vinayasa, the risks of injuries are much less. The high energy of Ashtanga, is not for all of us, luckily, there are other ways of approaching yoga as well. It is all about acceptance, towards one self and others, without judgement. i fully agree w/ thomas comment -you can practice this way as long as you are young and your body is resilient enough. i wonder how many of the 1st generation asthangis are still practicing the way. There are many different forms of yoga & it is up to the individual to find his/her own path, one that resonates with their inner Self. It seems Ashtanga is not for you Thomas, but to call it “self-violent”….I feel you are missing the point of Ashtanga. All forms of yoga, when practiced regularly, will bring the practitioner a leaner body….this is just an effect of yoga. We learn to surrender & listen to our bodies true needs, our food intake changes & we can also hear when we need to pull out of, or adjust an asana to avoid injury. It is the same in any yoga practice. I can agree to some extent with all the above replies to my comment. The approach we have to the practice is more important that the style and injuries can happen even in a slow practice. My experience as a yoga teacher however shows that most people with injuries I have met did practice Ashtanga vinyasa. Regarding the violence in this style, it will be self-explanatory to watch a video of the famous adjustments by P. Jois to his students http://www.youtube.com/watch?v=2B9nQ-nY2cY The scenes towards the end are shocking and I do not wish to anyone to end up in a class like this. Another suboptimal as I believe thing about Ashtanga vinyasa is the fact that it is a fixed sequence of asanas. It is clear to anyone who has taught various students with different body builds and joint flexibilities that one sequence of asanas cannot suit each and every student. Further, repeating the same set of asanas each time we practice will overload certain joints and muscles whereas others will remain underused. For a balanced and healthy practice, asanas need to be selected, adapted, and progressively changed for each individual. This seems so obvious yet Ashtanga vinyasa clearly goes against this principle and treats its fixed series in a highly dogmatic way. I have lived in India for 3 years, practiced with various teachers and have seen various degrees of dogmatism in practice. Everyone has the freedom to chose a practice that suits their body and mind, but I would strongly recommend that people practice more gentle styles of yoga BEFORE they try out Ashtanga. This will give them the time to increase their physical flexibility and more importantly to develop a sense of non-violence , non-competitiveness and non-achieving in their practice. i just love inna!!! !hari om!!! Great article! I love Mysore practice. Thomas, you might need to learn a bit more about Ashtanga before giving such strong comments. It is a mentor based system: you can go to the next asana just when your teacher can see that you are ready and YES! There are variations using your body instead of props, until you are ready to do the full version of the posture. You can go to led classes just when you are a bit more advanced, never from the beginning. The same set of asanas are meant to cultivate an inner practice, it’s just like a moving/ flowing meditation. I completely agree with Inna. Thomas, I wouldn’t be so harsh on Ashtanga Vinyasa as a method of well being. This method has restored me to health, against all the odds, on numerous occasions. It has made the impossible, possible. It has made what is a truelly intolerable disease, tolerable. It is my doctor, therapist, shrink, and lots more. This does not sound like a violent practice to me. Any system of Hatha based yoga can cause injury if practised without awareness. Finding a good teacher is the key. A good teacher will instill that awareness right from the start. I’ve tried other forms of Hatha yoga and no other system allows be the space to explore myself as a Mysore practice. I have done Mysore practise when I am barely able to move. The count, breath, bandha, drishti, visualization. I have done this practice lying flat on my back. I have done this practice in a wheel chair. I have done this practice when withdrawing from severe painkillers and steroids. I have done this practice in good health. Ashtanga Vinyasa is a moving mediation. It’s the responsibility of the practitioner to know how far to take things. If they go beyond their limits then they are not truelly practising Ashtanga Vinyasa. Also, a good teacher will know a students edge and not take them beyond it. I would recommend Ashtanga Vinyasa as a system of well being to anybody who reads this. Find a good teacher – mostly likely in a Shala setting. It has saved me. I believe someone’s yoga practice is a reflection of their inner self. Traditionally-taught Ashtanga yoga probably more so than many other forms. The system of breathing, moving, counting and asana gives a framework for someone to discover their yoga practice. Their practice for life. There is plenty of opportunity for a practitioner to be violent to themselves, as there is in other yoga methods and in the rest of daily life, but equally the practitioner may make themselves stronger, may find time to be kind to their body, to heal, to explore and understand who and what they are. Exactly as Mick wrote… Find a good teacher. One you trust. One to push you when you might waver. One to call you out when you go too far. One to accompany you on your journey as you learn who you are. Thomas, your comments are rather harsh and I’m surprised that you even use the word “violence” to describe Ashtanga or any other kind of yoga. As for practicing a set series of poses, Ashtanga is not the only method that follows that technique – Bikram has a set series of 26 postures. Sivananda and Integral Yoga (Swami Satchidananda) also have a set series for each of the levels they teach. In my opinion, it is all the 200 hour certified yoga instructors that know next to nothing who are bringing their own ego into their teaching with fancy variations and sequences. For me, yoga is about letting go of the ego, finding a good teacher and method, and surrendering to it. As for injuries, they are not always the fault of the particular style of yoga one does. More often than not, it is the practitioner who pushes their body too far, gets caught up in showing off, or is just plain unattentive to their own body. Even in Ashtanga it is possible to ease into each posture until you find the “comfortable, steady” version of the pose. But, alas, I’m sure as someone who has lived in India and has studied with many teachers you already know all of this and more……. Hi JoAnne, I agree with what you’re saying in that you have to be attentive to your own body and not push it for the sake of showing off; however, for me yoga and meditation is also about non judging. Do all the 200 hour certified yoga instructors really know next to nothing? There are some practitioners who practice over 40 years and they are stil do it like David Swenson,of course we can make injury also, I agree but we need to practice smart .